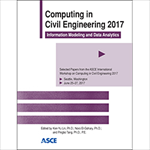 Improving the practice of civil engineering by promoting the effective use of current and emerging computing and information technologies as applied to civil engineering practice. Edited by Ken-Yu Lin, Ph.D.; Nora El-Gohary, Ph.D.; and Pingbo Tang, Ph.D., P.E. Early Bird Registration ends: March 22, 2019. Danny Kahler, P.E., M.ASCE, current Chair of the CI Digital Project Delivery Committee, gave a presentation on Digital Project Delivery at the recent ASCE 2016 Convention held in Portland, Oregon. The Computing Division of ASCE's Committee on Technical Advancement (CTA) is actively seeking a senior associate journal editor. Apply by emailing bsien@asce.org before October 15th!